Description: London, Religious Tract Society 1880s Frontispiece signed A.A. B. + 2 plates & titlepage illustrations and head & tailpieces. . 16mo decorated cloth with gilt lettering panels to cover & spine (tips bit worn) 127pp. 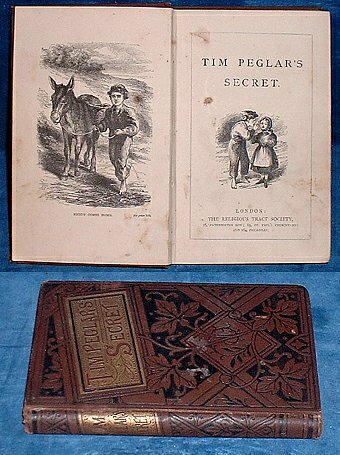 Reward inscription from Primitive Sabbath School Aug 1883 to Betsy Lengard + an unrelated bookplate. Two leaves with 1" tear without loss, inner hinge tender and some foxing. *Temptation and redemption in this story of a boy who is given a penny and buys an egg to place under the hen of a friendly dame, but bad company nearly cases the loss of temper, money and hen but recalling school lessons about the Bible he becomes a more thoughtful boy and all turns out happily.